Contrary to popular belief, eliminating household pests from your home can be accomplished without completely bombing your living space with a mess of toxic fumes. Whether you have annoying fruit flies in the kitchen, fleas on your beloved pet or silverfish lurking around your bathroom, it is very likely that a DIY, non-toxic and super inexpensive solution exists for your household bug problem. Take note: the best practice for pest control is prevention. Annoying bugs are there in the first place because you are doing something that makes your home an ideal hang-out spot. Not surprisingly, cleanliness is a huge factor in keeping bugs away. Be especially vigilant in getting rid of food crumbs and excessive moisture, especially in the kitchen and in bathrooms. No food and no water puddles lying around in plain sight equals no free meals for wandering pests. good question! future post, perhaps? The "Soda Bottle" method ALWAYS works on all flying insects. Cut the top portion of a 2 liter bottle, turn upside down and staple in two places to hold it in place. Fill bottom with a few inches of soda or sugar water/honey. Bugs get in and can't get out. While the method there will work, it is not the most simple or most effective. Adding a few drops of dish soap to almost any sweet liquid will work because the soap drops the surface tension that the fruit flies use to drink the liquid without harm. I used this in a wide mouth bowl with no plastic wrap to great effect. 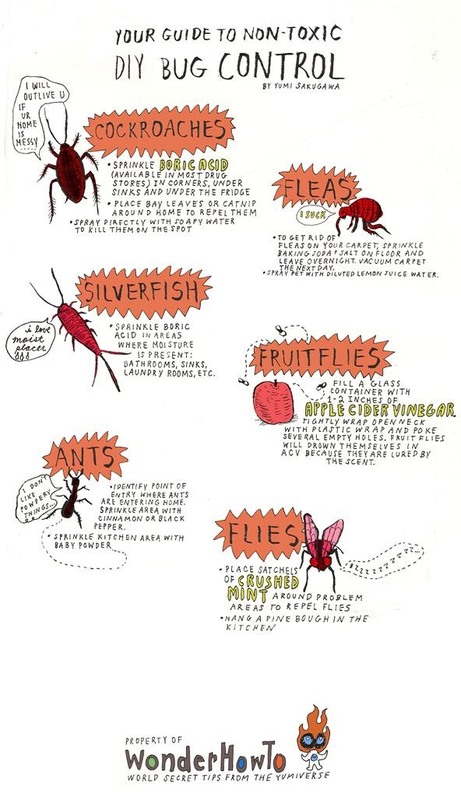 I wish I knew this when I had my own mini-fruit fly problem in my former apartment. Thank you for sharing this great tip with us! I freaking hate silverfish! My apartment in West L.A. was infested with them before I got there. Once they're in there, it's impossible to get rid of them. I should never have moved in. Boric acid became too messy for me to deal with. My manager even bug bombed the whole complex... tent and all, but they came right back. My solution... move, otherwise they'll be everywhere... even your silverware drawers. There definitely are worst-case scenarios when absolutely NOTHING works--and I've totally been there. One of my apartments in a really old complex had a terrible cockroach problem and it just got to the point where I had to move out. :( When it gets really bad, the best solution is to get away as quickly as possible! The fly trap works evenbetter if you take a coffee mug, add a piece of fruit and sugar. Then fill it up so that a bit of the fruit is above the water surface add two drops dish soap. The fruit attracts the flies and gives them a place to land, the sugar also helps attract, the dish soap breaks the tention in the water and the minute they slip off the fruit they can't get out. I have tried the above method but it just doesn't have effectivity.